I recently came across a mention of this statement below by Leon Battista Alberti (1404-1472), an Italian known for everything from art to architecture to philosophy. I’m not an expert on Alberti, or anything else, but I do enjoy reading about paint and color. It’s interesting that his concept of “true colors,” what today might be called “primary colors,” doesn’t include yellow, but instead has grey along with green. I’m not trying to argue his views as correct or go in depth with current, modern color science, but I thought it would be interesting to explore this historical view of color and try to understand Alberti’s point of view and how he may have come to his conclusions. First a little terminology. What Alberti refers to as a “genus” of color is what artists today call a “hue.” What he calls a “species” seems to be what we would call either a “tint” (lighter version of the same hue) or a “shade” (darker version of the same hue). So Alberti seems to have been firmly of the opinion that black and white were not colors on their own, but modifiers for other colors. Thus a light blue might have been considered a “lightened” blue or a dark blue a “darkened” blue, and may be considered different species of the same genus. Now let’s explore each of Alberti’s true colors and what sort of pigments he would have had available to him to represent them. He obviously had a fixation on the classical elements of fire, air, water, and earth. The modern artist’s palette is filled with a huge selection of bright, strong, and reliable pigments, but much of this is the result of modern chemistry from about the past two hundred years. In Alberti’s day, the selection of greens, blues, purples, and bright yellows would have been very limited. Even the intense reds were less than reliable and limited to those made with either mercury or lead. Most if not all of the pigments I reference are still available from certain brands of paint, even if only in dry pigment form, although many have been replaced by various modern pigments that may either be cheaper, less toxic, less prone to fading/darkening over time, or any combination of those. One question I quickly found myself asking was “which red?” Looking a selection of colors all referred to as “red” will show a large variety. Did he have a specific red in mind or was he thinking in terms of red as an entire category? I believe it was as a category, but still may be both. Consider than fire, which red was to represent, comes in a variety of colors, including yellows and oranges, and that most examples of fire I’ve seen include more reddish orange rather than any deep crimson red. I think it’s a possibility that Alberti viewed orange, and maybe even some yellows, as a form of red. In the context of representing fire with red this would make sense as red alone is not sufficient for painting fire, even mixed with black or white, unless your goal is a pink fire. As artists today have no problem considering both yellow-green and bluish-green to be varieties of what’s called “green,” he may have seen oranges and some yellows as varieties of red. This could, in part, explain the absence of yellow from his true colors. So what reds did he have? The two strongest, highest chroma reds would have been minium (PR105, also known as “red lead” and where the English word “miniature” comes from due to its use in the small letters of illuminated manuscripts) and vermilion (PR106, mercuric sulfide). How they’re made may also be relevant, as while both could be found naturally the artificial production of both involved large amounts of fire. Minium is a lead oxide that can be made by heating a form of lead with oxygen to oxidize it [link]. The artificial production of it was known to Cennino Cennini (1370-1440) who said it was “manufactured by alchemy.” Vermilion is made by combining mercury with molten sulfur [link]. I’ve seen a few examples of vermilion that seem to range in color a bit, including one that leans to middle red and some that are more orangish red. Due to their production methods Alberti might have equated red with fire for more than just its color. If he did have a specific red in mind as I suggested above I believe it would have been one of these two. 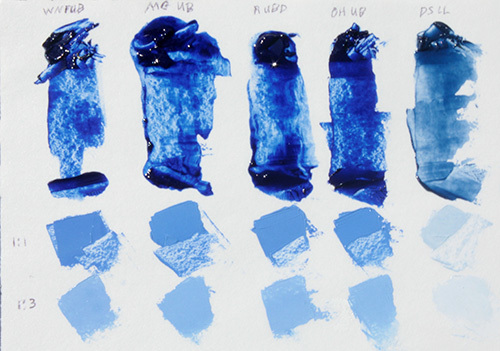 Blue pigments have always been of limited variety. Historically many of them were made from various crushed semi-precious stones. In my post about ultramarine, which is synthetic lapis lazuli, I discussed this briefly. It’s easy enough to say that the air, or sky, is blue, but even so at any given moment there’s more than one blue up there. Look at the horizon, and then look straight up. Now look at different times of day. It’s worth noting that the sky isn’t even always blue. I don’t mean just the reds or pinks of sunsets, but even the blackness of night. As with red, I believe Alberti was referring to blue as a category rather than to a specific color, or else which blue would he have meant? The historical selection of blue pigments was made narrower by the fact that production methods for two of them, smalt (PB32, ground glass containing cobalt) and Egyptian blue (PB31, calcium copper silicate), were lost at certain points in history. Both were known to the ancient Egyptians, but became lost, and while smalt might have been known in Europe during the lifetime of Alberti [link] (though debatably not), Egyptian blue wasn’t recreated until the 1800s [link] after being lost at the end of the Roman period. Azurite (PB30, natural mineral) should have been known to Alberti. The same for genuine indigo (NB1, made from a plant), although that’s possibly too purple. Lapis lazuli, also called lazurite and was the stone that natural ultramarine (PB29) was gotten from, was used extensively in the 14th and 15th centuries. It was very expensive though, and art clients had to specifically request its use. So why consider blue as the color of air? Besides the obvious, remember that Alberti said “as the shadow deepens the colours empty out.” The sky is similar, being empty of color at night but having its blueness appear as the light of day enters it. This one had me confused for a while. I’ve seen greenish water before, but only lake or stream water filled with plants and algae. Surely Alberti, living in Italy, would have seen the ocean at some point? Then I noticed that he referred to green a couple of times in the context of plants but not to water itself. Was his reasoning that water produced greenness in plants, therefore in nature water was responsible for green? Possibly. The greens he had available would have been terre verte (PG23, many varieties of green earths), verdigris (PG20, made from copper), and malachite (PG39, natural mineral). It’s interesting that each of these has some connection with water. 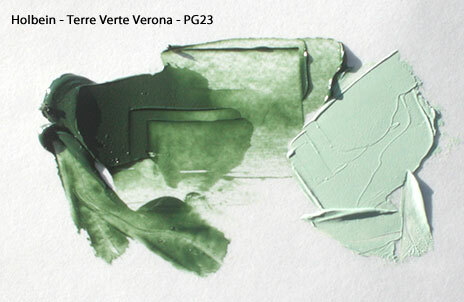 Terre verte is a hydrosilicate (so it contains water) and is found below sea level in ancient seabeds [link]. Verdigris is made by mixing various chemicals in water [link]. Malachite can be artificially made in a similar way [link]. As with the reds that all had an actual production connection with fire, these greens are all connected with water. As for yellow, I don’t at all think that Alberti didn’t have yellow on his palette, but rather that maybe he just didn’t consider yellow in the same terms that most artists today do. Assuming that he had ever mixed yellow with black, which I think is reasonable to assume considering his color model of both white and black simply modifying other colors, Alberti would have seen that the result is green. He may have thus considered yellow to be a subcategory of green. As he said, black changes the “species” of a color but not it’s “genus,” so I don’t think he would have considered the resulting green from yellow and black to be anything but a dark yellow, or rather yellow to be a very light/bright green. In keeping with the theme of green representing water, don’t green plants turn yellow when they dry up? So maybe yellow is a green that lacks water. I can’t say I’m not still a little confused on how he regarded yellow, especially considering my toughts on how he may have regarded red. Like much of what Alberti presented in his view of true colors, this confused me as well. Someone might look at this and think “but he didn’t consider black or white to be colors, so why grey?” I think I understand his viewpoint, demonstrated here. The swatch at the middle of each row is a starting color that’s been lightened to the right and darkened to the left. Referring again to his view that black and white are not colors but only modify colors, just think of grey as being a color which can be lightened with white or darkened with black just like any other color. He doesn’t seem to have addressed the fact that grey can be produced with a mix of black and white, but this is the closest I have come to making sense of this last true color. Considering grey to represent earth may also seem strange, until you consider two things. 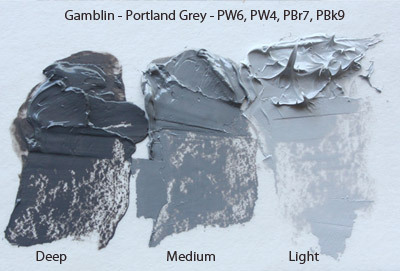 First, just as the previous true colors were all categories rather than a single specific hue or “genus” as Alberti refers to it, it’s possible that his view of “grey” may have included variations of greyed colors. For example many umbers, darker earth pigments that range from reddish to greenish in glazes tend to be very grey in tints, may be considered examples of greys. Second, there’s no small amount of grey granite that many mountains and cliffs expose. All in all, I found that Alberti was too fixated on the classical elements theme, which has many glaring shortcomings, and this limited his understanding of color. Even so, I thought it was interesting to realize the possible connections between the way different pigments are made and their associated elements. I love this post on so many levels! I particularly like the photo insert of the red/blue/green/grey swatches. I think I’m going to use this for my next painting. Thanks! It’s interesting how many different artists have created different views of color space. It’s written mostly in Dutch, but you can a lot of different concepts from history here.